Another one running the Nighthawk R7000. Only change to the R7000 settings was to set IP to dynamic from ISP. Attempting to turn on VLAN tagging stopped it working completely. What firmware are you running on the Nighthawk? @ipv89 seemed to have good luck upgrading to Advanced Tomato and enabling cut through forwarding. Downer seems to be getting slammed. My upgrade was requested last Wednesday afternoon. Still hadn't heard anything as of 30 mins ago so phoned Vodafone (as an aside, what am I doing wrong with Vodafone's phone numbers? Every time I dial I seem to get a different set of options or somehow end up talking to the wrong person). I spent most of that 30 mins on hold while my friendly CSR was on hold with Downer. Turns out the install is booked for Tuesday morning (not that they've told me this!). Unfortunately it's too late now to reschedule tomorrow morning's meetings so had to rebook for Weds morning. Can't wait! I did have to ask for the $100 3 day credit, but after checking (suoervisor I guess) it was applied without argument. Silver linings and all that. If you'd told me a month ago I'd have a month's free gigabit internet, there's no way I would have believed you. I'm still running the NetGear firmware, updating as required. It still does everything I need it to. Was hoping for a little more to be honest... but I guess 800 is pretty fly never the less! 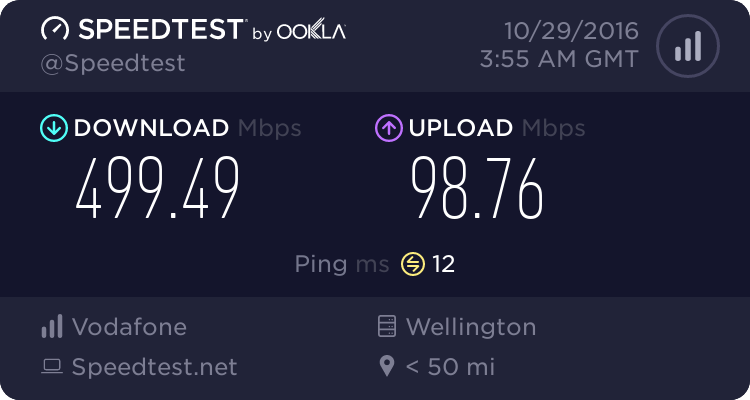 Try thread above, although a few people have mentioned that the interconnects are being upgraded, and thats probably bottlenecking everything right now. if i remember correctly. yes. its on 10G. upgraded during the gigatown in dunedin. 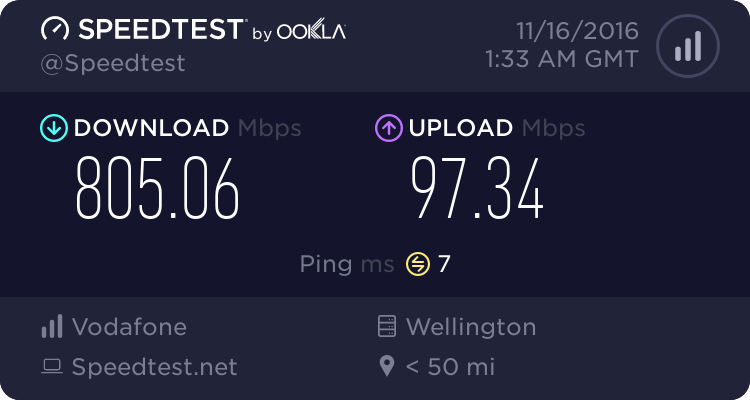 The max i got on the stock firmware was around 730mbps. The WiFi was good. 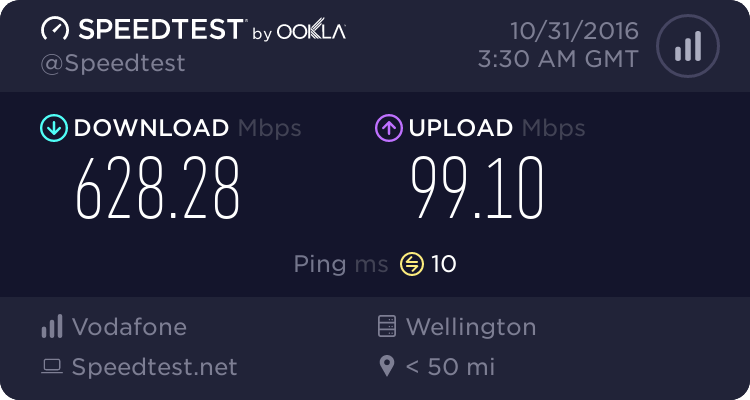 I upgraded to advanced tomato and got 950mbps but the WiFi was horrible. I dont get how a router as expensive is out performed buy the stock Vodafone offering. I am no longer using that router at all. If you upgrade to Tomato let me know and I can help if you need. Hmm, only getting 40ish mbps down up 20mbps up. Should be on FibreX200, suggestions?